iNKT cell help in MHC II−/− mice requires CD1d expression by B cells. (A) NK cells and CD8+ T lymphocytes were depleted from MHC II−/− mice as described in Materials and Methods. Control mice received no Ab (nil) or rat IgG. Mice were immunized with αGalCer+NP-CGG. At day 13, the NP-specific serum IgG GMT was determined by ELISA. (B) Top panel, Flow cytometry analysis of CD1d expression by B cells from the BMCs lacking CD4+ T cells and bearing CD1d+ (upper quadrant) or CD1d− (lower quadrant) B cells. Dot plots are gated on live circulating lymphocytes. Bottom panel, BMCs were immunized with NP-CGG plus or minus αGalCer. After 7 d, the NP-specific serum IgG GMT was determined by ELISA. One of two comparable experiments, each performed with five to eight mice/group, are shown. *p < 0.05.
iNKT cell help in MHC II−/− mice requires CD40 expression by B cells and CD40L function. 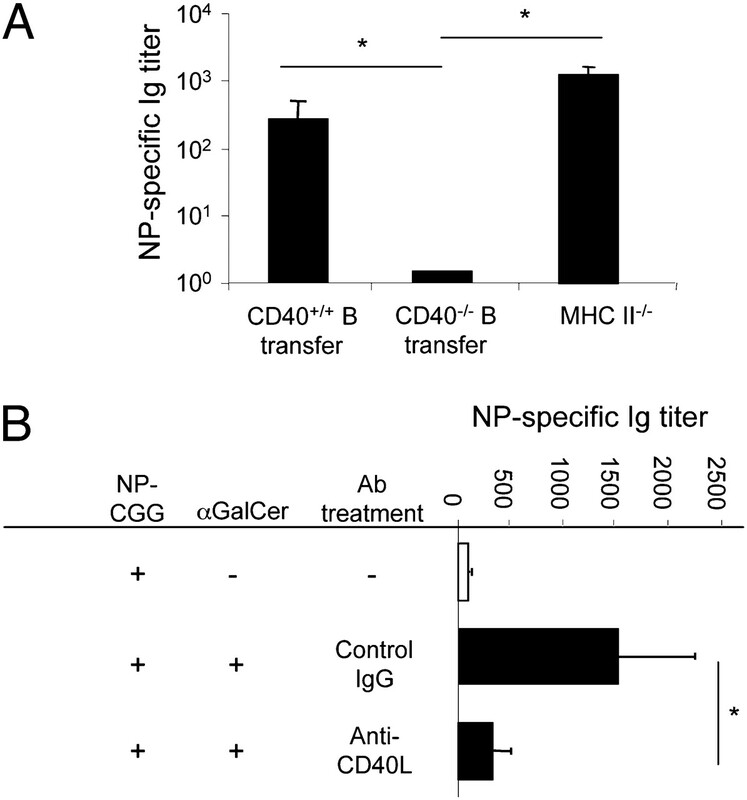 (A) μMT° mice were immunized with αGalCer+NP-CGG 1 d after receiving purified splenic WT or CD40−/− B cells. MHC II−/− mice were immunized as control. (B) MHC II−/− mice were immunized with αGalCer+NP-CGG while receiving anti-CD40L mAb MR1 or control hamster IgG. Both panels show the NP-specific serum Ig GMT determined 13 d after immunization. One of two comparable experiments, each performed with five mice per group, is shown. *p < 0.05. 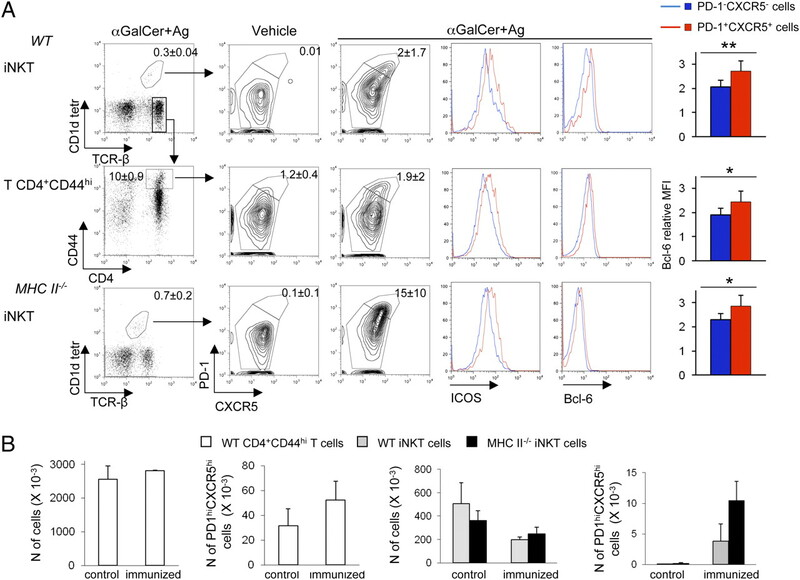 Immunization of MHC II−/− mice with αGalCer+Ag induces iNKTFH cell differentiation. (A) Spleen cells from WT or MHC II−/− mice obtained 7 d after immunization with αGalCer+Ags mix or with the vehicle alone were stained to assess CXCR5, PD-1, ICOS, and Bcl-6 upregulation among CD1d-tetramer+TCRβ+ iNKT cells or TCRβ+CD4+CD44hi Ag-experienced T cells. Numbers in dot plots quadrants indicate the mean percentage ± SD of the cells included in the gates. The histograms on the right show the increase in intracellular Bcl-6 expression between nonfollicular helper (PD-1−CXCR5−) and follicular helper (PD-1+CXCR5+) iNKT or T cells, quantified as the ratio between the mean fluorescence intensity (MFI) of cells stained with anti–Bcl-6 mAb and the MFI of cells stained with isotype controls. (B) Absolute numbers of total T CD4+CD44hi, T CD4+CD44hiPD-1hiCXCR5hi TFH, total iNKT cells, and PD-1hiCXCR5hi iNKTFH in spleens of WT and MHC II−/− mice 7 d after immunization with vehicle or αGalCer+Ags. Numbers were obtained by multiplying the percentage of the relevant target cells by the total number of splenic lymphocytes obtained from the immunized mice. One of three comparable experiments, each performed with three to four mice/group, is shown. *p ≤ 0.05, **p ≤ 0.01. GC reaction and transient specific Ab titers induced by cognate iNKTFH cells in MHC II−/− mice. (A) The GC reaction induced 7 d after αGalCer+Ags immunization of WT and MHC II−/− mice was assessed by confocal microscopy staining with peanut agglutinin (PNA) (GCs, indicated by arrows), IgD (B cell follicles), and CD4 (T cell zone) of spleen sections. Sections of spleens from nonimmunized WT and MHC II−/− mice were used as control. Shown are different magnifications of representative sections from one of three immunized mice analyzed per group. (B) Persistence of Ag-specific GMT Ig titers in WT and MHC II−/− mice were assessed after a first immunization at day 0 with αGalCer+influenza H3N2 or H3N2 alone, followed by a boost at day 14 with H3N2 alone (arrows). Results are from one experiment representative of three, in which 3–10 mice/group were tested. Asterisks indicate statistically different values between mice immunized with H3N2 alone or with αGalCer+H3N2. *p < 0.05, **p < 0.01. Supplemental Figure 1 (PDF, 166 Kb) - Supplemental Figure 1. 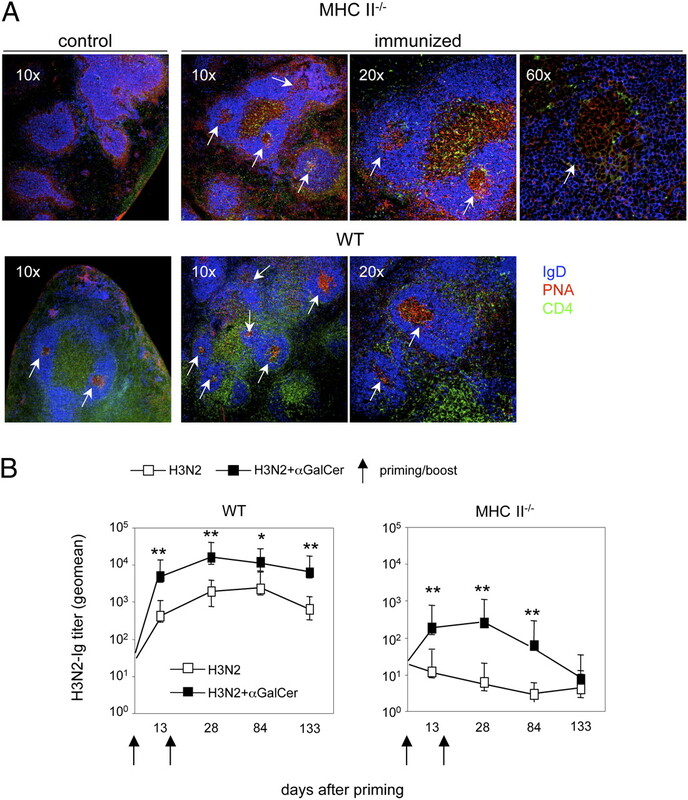 Depletion of NK and CD8+ T cells from MHC II-/- mice immunized with αGalCer+Ag.